The South Korea and North Korea summit took place at Panmunjeom on April 28, 2018 and the two heads of state agreed on the following among other things: the establishment of a permanent peace regime by July 27 this year participated by the two Koreas and the US (a trilateral peace regime) or the two Koreas, the US and China (a quadrilateral peace regime) replacing the existing armistice agreement. Through the above agreement, discussions and remarks the North Korean leader revealed that North Korea was suffering from a severe economic downturn and isolation from the outside world. There is no doubt that America’s extreme pressure and engagement policy and the United Nations Security Resolution 2397 (Dec. 23, 2017) have made a substantial impact on North Korea’s predicament. This means that he has little choice but to make a peace gesture to North Korea’s main enemies, South Korea and the US. The proposal for the establishment of a peace regime is a new and very important one. I believe that South Korea and the US, as the de facto parties to the Korean Armistice Agreement, should jointly formulate a permanent peace regime on the Korean Peninsula. The existing armistice system should be replaced by a peace treaty concluded by the parties directly involved in the Korean War, namely South and North Korea, the US and China. Therefore, the permanent peace regime should be quadrilateral, not trilateral. The peace treaty should include provisions dealing with the border line, non-aggression, a peaceful resolution of disputes, military confidence-building and arms control measures, denuclearization of the Korean Peninsula, a peace maintenance mechanism, and a high-level committee or committees in charge of reunification and conflicts and cooperation in various fields between the two Koreas. Among the above various items, the peace maintenance mechanism is the most important one. There can be five different models. One is a South-North Korea Peace Treaty. Under the treaty South and North Korea maintain their respective military alliances and reduce their military forces to the same level, while the US ground forces in South Korea can withdraw from South Korea. On the other hand, the US and China renounce the first use of nuclear weapons in case of a war on the Korean Peninsula. The leaders of South and North Korea, the US and China may start negotiations using this model as a blueprint. Another peace maintenance system is a two-plus-two peace system. Under this system the two Koreas conclude a peace treaty and the US and China participate in and guarantee the treaty. At the same time South and North Korea renounce their respective military alliance treaties with the US and China. This treaty also includes the arms reduction agreement and the declaration of denuclearization. The third type of the peace maintenance system (a two-plus-four peace system) is a Northeast Asian security system participated by all the states directly involved in peace and security in Northeast Asia (the two Koreas, the US, Japan, China and Russia). This system incorporates the South-North Korea peace treaty, the four powers’ guarantee of the peace treaty and the renouncement of all the other military alliances involving the two Koreas, a disarmament and arms control agreement between South and North Korea, and the declaration of denuclearization. The fourth one is a two-plus-two peace system (a Locarno formula) which incorporates the South-North Korea peace treaty, maintenance of the South Korea-US alliance and the North Korea-China alliance, guarantee of the peace treaty by Russia and Japan, and the declaration of denuclearization. The fifth model is a four-plus-two peace system proposed by Henry Kissinger during the Nixon administration. It consists of a South-North Korea peace treaty, American and Chinese participation in and guarantee of the treaty and Russian and Japanese guarantee of the treaty, the end of the South Korea-US alliance and the North Korea-China alliance, a disarmament and arms control agreement between the two Koreas, and the declaration of denuclearization on the Korean Peninsula by all the parties. We can use certainty of the four great powers’ guarantee of South Korea’s security, acceptability by North Korea and China, durability, and degree of contribution to Korean reunification as criteria to determine which one is the best among the above five models. According to these four criteria, the fourth model is the best, mainly because of the geopolitical characteristics of the Korean Peninsula and Northeast Asia, peace on the Korean Peninsula can hardly be preserved unless the two Koreas each form a military alliance with one great power and the other two great powers jointly guarantee it. Theoretically, the US and Japan on the one hand and China and Russia on the other form a trilateral alliance with South Korea and North Korea respectively. But under the current security environment in Northeast Asia, it is impossible. Even under a unified Korea the situation would be similar. The balance of power is the most realistic means to preserve peace on the Korean Peninsula. Neutralization of both Koreas can be theoretically the most ideal solution but practically impossible. The two Koreas blame each other for conflicts and tension between themselves. The North Korean ruling machine has survived by imposing its Juche ideology on the people and by exaggerating the threats from its two eternal enemies or using them as scapegoats. An absolute majority of the South Koreans are sick and tired of tension between the two sides. This is reflected in the fact that the number of people who don’t want to think about North Korea and reunification is increasing. The Korean tragedy is ironical for two reasons. One irony is that most multi-ethnic states in the non-West suffer from ethnic conflicts, but Koreans, a homogeneous ethnic group, formed two highly ideological states and have been engaged in brutal conflicts for 70 years. Another is that the global cold war which divided Korea into two political entities was over by 1990 but the cold war in Korea has not yet ended. 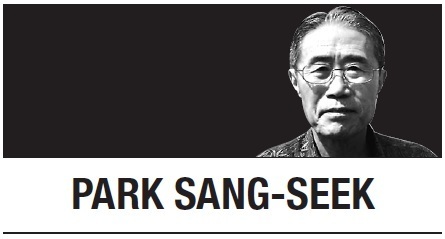 Park Sang-seek is a former Chancellor of IFANS (now National Diplomatic Academy), Foreign Ministry and the author of “Globalized Korea and Localized Globe.” -- Ed.